The holiday season is full of friends, family, and goodwill. But, let’s admit it, it’s also a marketing blitz through every imaginable consumer channel. This time of year your gym or studio’s prospects’ email accounts are bursting at the seams with “LIMITED-TIME OFFER!” and “ACT NOW BEFORE THEY’RE GONE!” emails. It’s overwhelming and most of us tune out. Want to stand out in crowded inboxes? Write better subject lines. Subject lines may be the last touch to your marketing campaign, but they certainly aren’t the least important. Below we work through eight tips to craft better subject lines for email marketing campaigns. Ideally, your subject line should stop a reader in their tracks. Breaking their inbox routine of mechanically clicking read on new emails without a second thought. Asking a question that applies directly to your audience in the subject line can hook even the most disinterested recipient. Especially if the answer will directly benefit or inform their fitness experience. Decades of spam has created a very skeptical, cautious email community. Avoid overusing well-worn sales tactics such as all caps, promising free gifts or services, or creating a false sense of urgency by claiming a limited-time offer only to run the same promotion every week. If you dig these tactics out of your toolbox for every subject line, you’ll condition your recipients to distrust your email content. Segmenting your email lists into specific audiences is a proven strategy for boosting open rates. 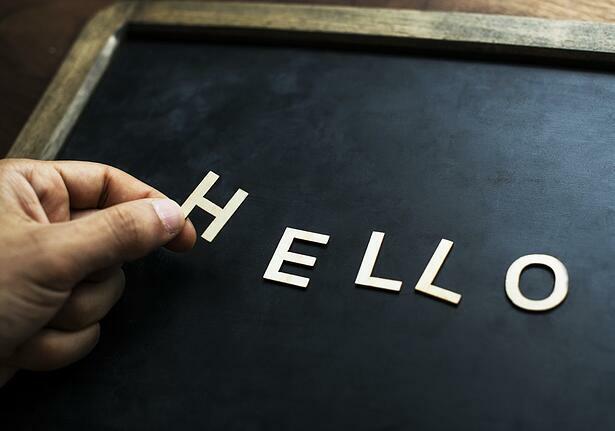 CRM software like Club OS gives you the tools to segment prospects by a variety of factors such as their lead type, club visits, creation dates, number of contacts, completed guest passes, and a lot more. 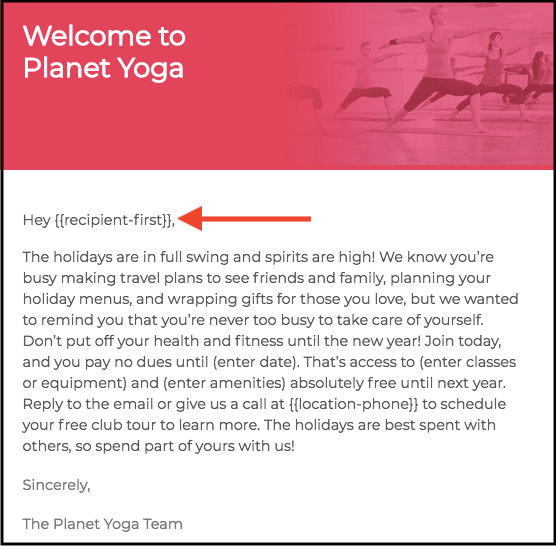 With segmented audiences, you can localize your subject line message to your recipients. Action-oriented verbs animate your subject. They tell your reader the action they need to take rather than vaguely alluding to the action they can choose. 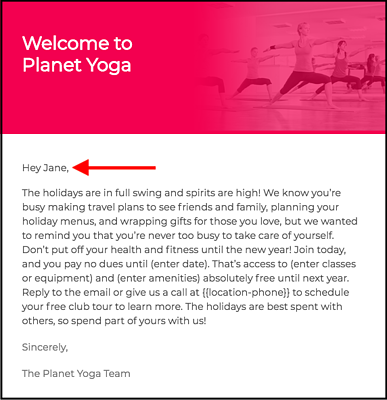 Draw the reader’s eye to your subject line by including their first name. CRM software like Club OS enables you to utilize merge tags: code placeholders inserted into subject lines and emails bodies which automatically fill with each individual recipient’s information once the email is sent. Merge tags transform an email intended for hundreds of recipients into one which feels designed for each individual. Preview text is the snippet of your email body that is featured in the inbox. Make it work in tandem with your subject. If you craft an intriguingly vague subject line then your preview text should give the reader just a touch more context to motivate them to open the email. But avoid answering questions you pose in the subject line in your preview text. The recipient should have to open the email to find the answer. KISS: Keep. It. Short. Sender. You’re trying to catch skimming eyes. Meandering sentences get lost. HubSpot recommends "using subject lines with fewer than 50 characters to make sure the people scanning your emails read the entire subject line." Not to mention, roughly 50% of emails are opened through mobile. Short subject lines safeguard you against cutoff text on smaller mobile screens. You were already banging your head against the wall just to write one subject line, now you have to write two? Trust us, A/B testing is an awesome tactic to uncover what works and what doesn’t in an inbox. It may be double the work, but it can be half as hard. Writing one subject line pressures you to make it perfect. A/B testing lets you get creative. Write the funny line or the weird line or the really, really weird line. The point is to experiment until you find the subject line formula that generates the most clicks. Have fun with it! Don’t stop at subject lines! We have tips on enhancing your club’s entire email marketing strategies. Check out our Complete Guide to Email Marketing For Gyms and Studios.